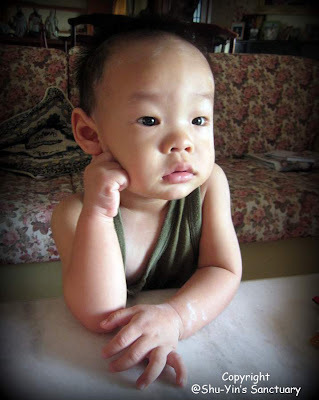 Shu-Yin's Sanctuary: What would a 17-month-old baby be thinking? Or maybe whether should I cry now just to make mummy give me another bottle of Yakult? Anyway, this is just another photo which I could not resist uploading. He looks too cute here - with one hand on the table supporting his chin! yes. i like this photo too. he's probably thinking how he can be richer than his dad. muahahhaa. i rather he think how to b a clever boy!